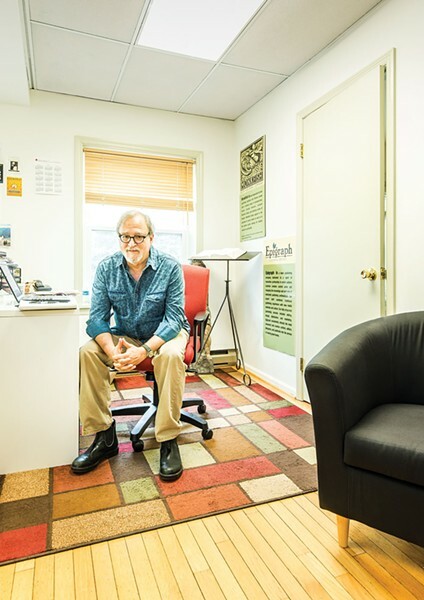 Publisher Paul Cohen in his office on East Market Street in Rhinebeck. Since the dawn of the internet, one question has occupied the minds of readers, writers, and publishers alike: Is the book dying? Statistics say no. According to the Association of American Publishers, book publishing revenue was up 4.9 percent, or $108 million, in the first quarter of 2017, compared to the first quarter of 2016. But the book's future hasn't always looked so bright. "In my 25 years in publishing, I've seen massive changes," says Paul Cohen, who founded Monkfish Book Publishing Company, specializing in spiritual books, in 2002 in Rhinebeck, and Epigraph Publishing Service in 2007. In 1992, Cohen was an international books distribution sales manager with 5,000 independent bookstore accounts, accounting for 80 percent of his business; chain stores made up the remaining 20 percent. "Amazon was a tiny blip," he recalls. "Ten years later, the chain stores nearly killed the indies, then Amazon drove Borders Books out of business. Now everybody hopes Barnes & Noble will survive. They were the enemy; now they're the hero. Publishers don't want to be stuck with just Amazon." Cohen survived drastic industry changes, like the advent of eBooks, by adapting. A devoted spiritual seeker and voracious reader of spiritual literature since adolescence, he fell in love with publishing while working in distribution, and vowed to start his own company. Monkfish has since published over 60 titles, including The Physics of Angels by Rupert Sheldrake and Matthew Fox, Elizabeth Cunningham's award-winning The Maeve Chronicles series (including The Passion of Mary Magdalene), and Yoga for Diabetes: How to Manage Your Health with Yoga and Ayurveda by Rachel Zinman. But Monkfish's survival called for radical moves. "Those early days were blissful—propping my feet on that first desk, feeling I'd finally found my true calling," Cohen says. "Then self-publishing happened, questioning the traditional publishing contract's validity. Publishers felt unnecessary—and terrified. In 2007, I decided, rather than being intimidated by the industry changes that were rocking my boat, I'd start a self-publishing imprint myself." Epigraph launched with Some Delights of the Hudson Valley: An Anthology of Hudson Valley Humor, edited by The New Yorker cartoonist Danny Shanahan. The imprint has since published over 200 books, including the acclaimed graphic novelist Lucy Knisley's French Milk; Benjamin Tupper's Welcome to Afghanistan: Send More Ammo; Spanish journalist Guillermo Fesser's memoir One Hundred Miles from Manhattan; and Void If Detached: Seeking Modern Spirituality Through My Father's Old Sermons by Sarah Bowen, which won a 2017 Independent Publishers Book Award. Publishing books has commercial, aesthetic, and spiritual sides—sometimes moral or scientific or philosophical components too. As a publisher, I have to bring all these parts together. It has long been a desire of mine to see the world's religions existing peacefully and happily with each other. Whether they do or they don't in the real world, they do in the Monkfish book catalog. All the world's religions are represented in our books, and the titles are listed together—not a single argument! That brings me a certain joy. What is it like to be a book publisher today? It's surreal. Like so many industries, publishing is in a deep state of flux. It has gone from being a stable, even conservative profession, to one requiring constant adaptation. But at the same time, the playing field is increasingly leveling, so it's actually easier for a small company like Monkfish to compete against the major publishing houses—although we now have to compete against everyone else as well since the bar to entry is getting lower and lower. Publishing is very different from what I had originally envisioned but it's still an exciting time to be a publisher. Monkfish publishes both spiritual and literary titles. How did you choose those subjects? My original intent was to publish spiritual books that were interesting and readable. While working in spiritual and religious book distribution, I saw how important language and the editorial process are to spiritual transmission, and yet how neglected they often are. Why and/or how do you choose the titles you publish? I consider both the manuscript and the author. First and foremost, is the manuscript compelling? Does it truly add something to the ongoing conversation of whatever the subject matter is? I also want to understand the writer and where this manuscript lies in the trajectory of his or her literary output. I want to champion my authors, so I'm always looking to feel a certain simpatico with them. For economic reasons, I can't publish all the writers—or books—that I feel strongly about, but I want to be able to get behind the books I do publish. I have to feel passionate about the work because the presence or absence of that passion communicates itself to our publishing partners—the distributors, sales reps, and bookstores—and can make or break a book. Monkfish is designed for seasoned spiritual seekers as well as neophyte seekers. Seekers strive for a kind of deep peacemaking, communication between the surface and deep levels of understanding of both reality and literature. I think it helps to be a "know-nothing" if you really want to find out about something. So the seeker's mentality is at the heart of the Monkfish list of fiction and nonfiction—a list that crosses over all religious denominations. What are the best—and worst—parts of owning an independent press? Freedom of self-expression is the best part. Having no one but myself and the market to answer to seems like an amazing gift after having worked for others for most of my adult life. In a similar vein, the responsibility for that self-expression, the need to pay for it in some way or another, is certainly challenging. Along with those early days of realizing you had fulfilled your dream, what has been your most memorable Monkfish moment? Four years in, I realized I needed to diversify Monkfish's income stream. Book publishing is not a terribly profitable business and it's only gotten more difficult over the years. I researched emerging industry trends and saw these spikes in self-publishing and in eBooks. I mentioned this finding to a colleague who encouraged me to begin a self-publishing imprint, Epigraph. At first, I was insulted but it has been a saving grace on many levels. How has the publishing business changed in the last 15 years? In deep and previously unimagined ways. For nearly all of the 20th century, the majority of published books went out of print after a few years due to the high costs of reprinting; those costs have essentially disappeared with the advent of on-demand print and distribution. At the same time, there is a new demand for deeper knowledge, because people are used to getting answers to their questions right away online. In 2002, when I started Monkfish, the total number of new titles was over 250,000. Last year, thanks to legitimate self-publishing options, on-demand publishing, and eBooks, there were more than 2.5 million new titles. That's proof that we're living in the information age. I see continued expansion for both the Monkfish and Epigraph imprints. I started Monkfish with North American distribution. Since then, our distribution network has expanded internationally to the UK, Europe, South Africa, and Australia. I anticipate we'll be selling our books much more widely internationally. The spiritual book genre is truly universal. You can't say that about many genres. At the same time, due to technological advancements, we're able to publish Monkfish titles in more varied ways. When we started, there was really only one way to publish. Every title was a major undertaking, so we were limited. With the advent of on-demand publishing and eBooks, we're able to publish titles that previously would have been considered too risky, so we'll be increasing our total annual title output.